We have in our grasp the power to shape the future. We have the ability to provoke change, to bring about something greater than we can ever imagine. We see the possibilities everyday; we see the potential shape of the future when we walk out our front doors, when we get out of our cars, when we’re driving down the road. It is something small, something seemingly insignificant, yet something of great value, of great importance. You may be thinking something along the lines of “opportunities to serve people” or “opportunities to change lives.” These responses are perhaps half-right. The real opportunities exist in our children. We have the ability to change the future through what we teach our children. The foundation of the future is built upon what we teach the children of today. These children we see everyday will become the lawyers, the politicians, the community leaders, the workers, the pastors, the deacons, and the teachers in the future. The things we teach them now will guide the direction of many lives in the world to come, through their interactions with one another. It is important, imperative even, that we teach children. It is important that we build a foundation in them. Not only are we seeking to build and lay a foundation in them for the future, we are looking to build a strong and durable one. The foundation helps guide how the house will be built and ensures a strong and sturdy house. As such, if we build a Gospel-centric foundation in the children in whose lives we have an impact, we then help maintain a future church, and a future world, based on the Gospel of Christ, seeking to glorify and honor God. It is important, for this reason, that our teachings should be in line with the Gospel and the truths therein. We present the Gospel as the cornerstone of all things, of all truths, of all evidences, of all doctrine so that, in turn, the foundation these children create may lead the future. In preparing them with a strong foundation, we prepare them to weather the storms the world will throw at them. We prepare them so that when the world tries to lure them away with compelling, albeit incorrect, arguments, debates, with precepts and philosophies, with temptations and sweet words, they will be ready to counter and stand strong. We prepare them to remain firm in Christ through all things. The world has realized that the fight for the future begins at the foundation. We see this today in our public schools, as the world fights to keep out Christian concepts, doctrines, and philosophies, and attempts to replace them with worldly philosophies and ideas, ranging from metaphysics to everyday issues. They seek to instill in them self-seeking values only leading to the destruction of themselves and the people around them. If we do not teach children truth and the absolutes of it, then we potentially condemn them to moral relativity and other such dangerous teachings. Another reason we seek to teach children is, not just because they are a future foundation, but because they are malleable. They are easy to teach and quick to learn, compared to adults, in regards to habits and foundational ideas. As we consider them the foundation of the future, we can also view them as wet concrete: malleable and changing yet, as it grows firm (adulthood), it hardens and cannot be shaped again. While adults are capable of learning new habits, new principles, new everything, it is much easier for a child to be built up on foundation of good habits and principles than it is to change an existing foundation. It is more difficult for adults to learn new perspectives, new ideas, and new concepts. Children, on the other hand, are filled with a sense of wonder, a desire to learn and understand the world around them. They look to adults to be role models; they seek to shape themselves after the people they respect. They are capable of becoming a great foundation, capable of becoming great leaders and teachers within their communities but, first, we must shape them into that Gospel-centric foundation. We must instill in them a basic, yet profound, foundation in Christ; a foundation built on the Bible, on the prophets, on the principles and commandments of God, centered on the Gospel of Christ. Children, being our future foundation, being more teachable, more malleable, generally have more time in their lives to reach others for Christ and to better the world in which we live, for both themselves and future generations. It was D.L. Moody who said “If I could relive my life, I would devote my entire ministry to reaching children for God.” A properly taught child will continue to be built upon, from foundation up, being built up for the sake of the Gospel, to glorify and honor God in his generation. A properly taught child will instill these values, these principles and ideals, in future generations. This, in effect, is like a snowball rolling down the hills of time, influencing and impacting many people, throughout time to come, for the sake of the Gospel. They will teach future generations ahead of them through interactions, through examples, through their words. 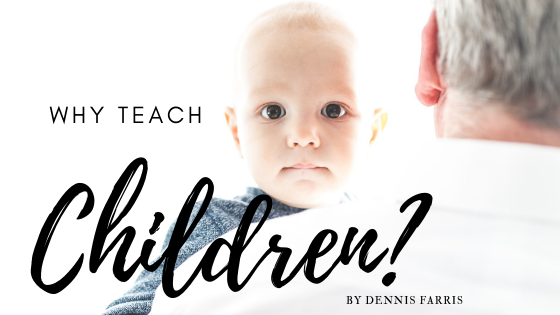 If none of this is convincing, then, at the very least, understand that teaching children is supported from a Biblical standpoint, commanded by Paul in Ephesians, and was expected of the Jews. In the Shema, a section of the Torah (Old Testament Books of the Law), God commanded the Jews to teach the Law diligently to their children (Deut 6). Proverbs 22:6 says,“Train up a child in the way he should go; even when he is old he will not depart from it.” We get a similar idea to what was mentioned earlier, that children become set in the ways they are taught. In Ephesians 6:4 we see Paul writing to the church in Ephesus, telling fathers to discipline and instruct children in the way of the Lord. The teaching of children was commanded in the Law to the Jews and commanded of us in the New Testament. We can see from this standpoint why it is important to teach children. While we do focus on the future, on the future of the church and the world, we must also realize that each and every child is an individual, loved of God (Matthew 19:13-15), and is in as much need of the truth as any adult around us. They are capable of understanding more than we realize, seeing more than we could imagine. It is important that we take up the initiative and train them up in the Gospel. Written by Dennis Farris, Team #9 Intern. To learn more about the CBM Internship Program visit [www.childrensbibleministries.net/internships]. To learn more about the ministry of CBM and how we reach kids with the gospel of Christ visit[www.childrensbibleministries.net]. No Replies to "Why Teach Children?"